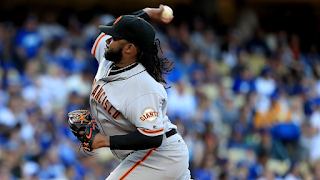 Johnny Cueto wasn't quite perfect Saturday night, but his performance was enough for the Giants to down the Dodgers, 4-3, and even the weekend series. The right-hander took a perfect game into the fifth inning and finished with just one earned run in 7 1/3 innings pitched, a strong bounceback effort from a six-run start in San Francisco last Sunday. His three hits allowed was his best regular-season mark since a two-hit shutout against the Nationals last July. Yasmani Grandal was the consistent thorn in the Giants' side, hitting a double into center field that broke up Cueto's perfect game and making a juggling grab on a foul popup in the seventh. Grandal also hit a double to lead off the ninth inning and eventually reached third, where he was stranded to end the game as Giants closer Santiago Casilla induced a game-ending fly to left from pinch-hitter Yasiel Puig. Giants manager Bruce Bochy fleetingly considered bypassing Puig by intentionally walking him. But, with Casilla on the mound, Bochy rejected this idea just as quickly. "I've got my closer out there. I didn't want to send a message that I didn't think he could get him," Bochy said. "I had confidence in him." Can-do Crawford: Shortstop Brandon Crawford's all-around skills made a significant difference for the Giants. He ran down Trayce Thompson's fly ball to left field in the third inning and made a remarkable over-the-shoulder catch. One inning later, Crawford smacked a run-scoring, ground-rule double to left. Crawford made his presence felt, just as the Giants missed him while losing Friday night's series opener. "You're talking about one of the best all-around shortstops in the game," Bochy said. "I don't care who you have. He's a difference-maker. … He's one of our guys. Any time you take out one of your core players, you're hoping the guy going in for him can pick him up, but you don't expect him to be as good as the guy that's starting." Asked whether Crawford's catch ranked among his best, Bochy said, "It's right up there. That was impressive. That was a Willie Mays-type catch, with his back to the ball. He made it so easy, too. Anything he does, doesn't surprise me. I've seen it so many times." Going to extremes: Though Javier Lopez yielded Seager's homer, it was a decent night for the Giants' bullpen. Two of the 'pen's younger relievers, Hunter Strickland and Josh Osich, each recorded a key out in the eighth, and Casilla looked strong while racking up his third save. Kazmir stumbles again: Kazmir had another disappointing day on the mound, allowing four runs and 11 baserunners in four-plus innings. His outing went south in the top of the fifth, when four straight Giants reached base. The final straw was Brandon Belt's single to scoreJoe Panik, which led to a call for Adam Liberatore. Kazmir has allowed 10 earned runs in two starts against the Giants in 2016. "I was actually looking at video, just pitches that were not aggressive in the strike zone and four walks, that's a tell right there," he said. "Fifth inning, that's something that's really frustrating, just not attacking hitters. Just getting out of my game, I think that was the main thing that I saw." Giants: Right-hander Jeff Samardzija, who'll start Sunday's series finale against Los Angeles, has made just two career appearances -- including one start -- at Dodger Stadium. He's 0-1 with a 6.14 ERA in those outings. First pitch is at 5:05 p.m. PT and the game will be televised on ESPN. Dodgers: Kenta Maeda will take the mound looking to make a third straight scoreless start in the rubber match. He had the same line (6 IP, 5 H, 0 ER, 4 K) in both of his first two starts with the Dodgers.